GitHub - mwijnands/FeaturesMvc: Enabling feature-based project structure for ASP.NET MVC. Enabling feature-based project structure for ASP.NET MVC. Want to be notified of new releases in mwijnands/FeaturesMvc? In short, this structure keeps all files that encompass a feature, closer together. the default structure will quickly become a mess as a project grows. The features structure also works within MVC Areas so you can group features together in an Area. The FeaturesMvc packages are available at NuGet. Now you can add a Features folder to the root of your MVC Web Application, and start to add features. Note that the name of a feature folder should be the same name as the name of the feature controller. Because the root folder of your views is now /Features instead of /Views, your views will not find _ViewStart.cshtml anymore (if you are using it) and the Web.config from the /Views folder will not be used. 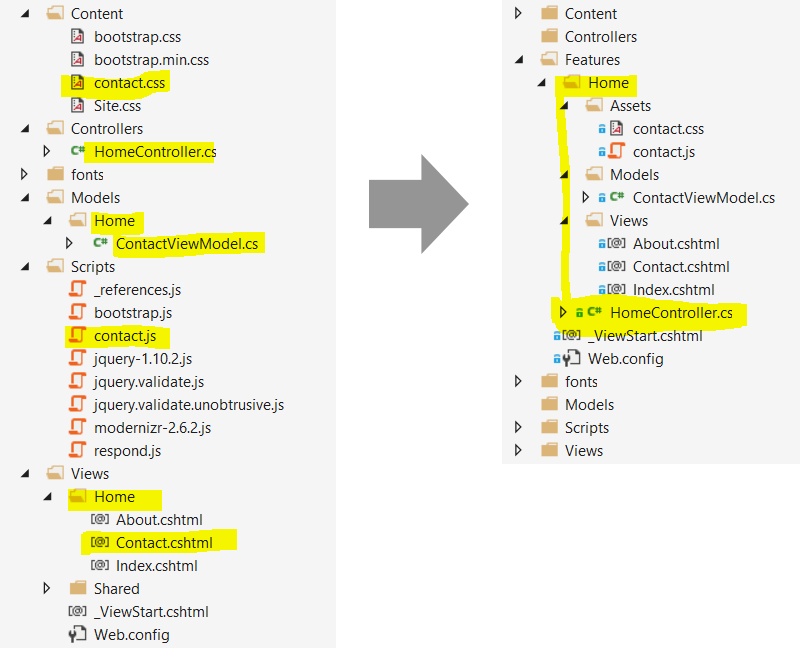 Therefore you will need to copy over the _ViewStart.cshtml and Web.config from the /Views folder to the /Features folder. That is all that is necessary to get the basic functionality working. Documentation is coming. In the meantime, check out the sample project on GitHub.